A fixture at the entry end of the Dodge lineup from 1960 through 1976, the Dart was discontinued in 1977. Decades later, for the 2013 model year, it was resuscitated, affixed to an all-new line of compact sedans. Following up on powertrain and features changes introduced for the 2014 model year are two major changes for 2015. First, the 184-horsepower, 2.4-liter Tigershark MultiAir2 engine that powers SXT, Limited and GT models is newly available as a Partial Zero Emissions Vehicle (PZEV), in 14 states. 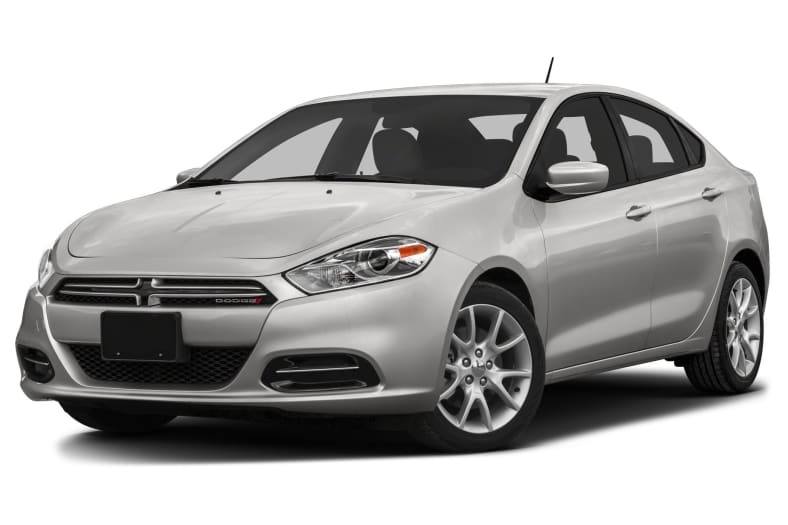 In addition, the 2015 Dart SE includes a Convenience Group at a discounted price, adding air conditioning, power locks and mirrors, remote keyless entry, underbody aero treatment and active grille shutters. Also for 2015, the Uconnect 8.4-inch touchscreen radio is updated to include Android smartphone compatibility, and a CD player is now a standalone option. The Blacktop appearance package, introduced during the 2014 model year, continues into 2015. Although the modern-day Dart occupies the same position in the Dodge passenger car hierarchy as the original, similarities end there. The first car to incorporate engineering elements from corporate parent Fiat, the revival Dart is a contemporary front-drive compact facing a considerably stronger competitive environment. So far, it seems to be a compelling alternative to the Chevrolet Cruze, Ford Focus, Honda Civic, Hyundai Elantra, Kia Forte, Nissan Sentra, Mazda 3, Subaru Impreza, Toyota Corolla, and Volkswagen Jetta. Dart styling is crisp, if not exactly head-turning. The structure is solid, engineering credentials look good, and the number of equipment and trim choices is exceptional. Like other compacts, the Dart targets young adults. The Dart makes a good case for itself with young parents, thanks to an exceptionally roomy interior by compact sedan standards, and a respectable complement of standard safety features. Even though fundamental elements of its unibody foundations were adapted from the Italian Alfa Romeo Giulietta hatchback, they were stretched to accommodate the sedan body style: longer wheelbase, longer overall, wider track, wider body. The dimensional expansions were accompanied by structural enhancements; 68 percent of the bodyshell is said to be high-strength steel, yielding a chassis that feels exceptionally solid. Just as important, the Dart presents one of the broadest range of choices in its class: five trim levels, nine exterior colors, seven wheel designs from 16 to 18 inches, three different four-cylinder engines (160-horsepower 2.0 liter, 160-horsepower 1.4-liter turbo, 184-horsepower 2.4-liter), and three transmissions (6-speed manual, 6-speed automatic, 6-speed dual clutch automatic). Though some of the engines incorporate the innovative Multi-Air induction technology pioneered by Fiat, Chrysler's corporate parent, all three engines are assembled in Michigan. Final vehicle assembly is at Chrysler's factory in Belvidere, Illinois. Most important, the Dart stacks up well in today's two most critical considerations: MPG and MSRP. EPA fuel-economy estimates range up to 41 mpg on the highway (for the Aero model). Suggested retail pricing opens at $16,495. Demerits: just one. For all the emphasis on the weight-saving benefits of high-strength steel, the Darts are a little pudgy by compact standards.